1. Preheat the oven to 190ºC, gas mark 5. Make the rémoulade: peel the celeriac and, using a mandolin or a very sharp knife, cut into fine strips. Place the shredded celeriac in a bowl and add the mustard, capers, cornichons and lemon juice. Chop the herbs and add them to the bowl. Stir in the mayonnaise and season with salt and freshly ground black pepper then reserve, covered, in the fridge. 2. Remove the ribs from the packaging and cook according to pack instructions. 3. In the meantime, using a mandolin, slice the potatoes into slices 2mm thick. Using a sharp knife, slice them into thin strips and dry with kitchen towel. Place a deep pan over medium-high heat and fill halfway with oil, allow to heat up to 180ºC and sprinkle the strips of potato in the hot pan. Fry for 5-6 minutes until golden then, using a slotted spoon, remove the potatoes from the oil into a bowl lined with kitchen towel and season with salt. 4. 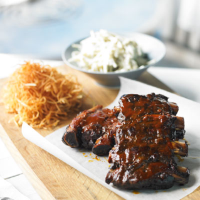 Once the ribs are done, remove from the oven and serve with the rémoulade and the shoe string potatoes.